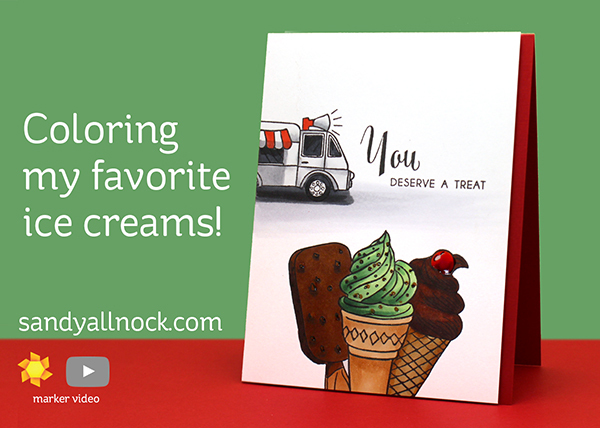 Today’s video is a quickie – before the ice cream MELTS! Gah! I filmed this a few weeks ago when it was in the upper 90s at my house – which meant 85 in the house. Thank goodness for a breeze! But boy did it have me dreaming of the ice cream truck of my childhood. Watch the video below or click HERE to see it in HD on YouTube. What’s your favorite flavor or type of ice cream?! Two hands up for chocolate! From one chocoholic to another: That was awesome! I am always astounded at your ability to see such dimension in everything you color. Thank you for sharing your art and I can only hope a little bit of your “artistic vision” rubs off on me and my card making abilities. We begged Mom to let us run to the ice cream truck for our favorite ice cream too. My favorite was chocolate and still is today. I would on occasion get an orange push up. Thanks for sharing and getting me to think about those good ole days again. Love it…but vanilla’s my fave. What Copics would you use to color vanilla? I haven’t been satisfied with any of my combos yet. Thanks for another great card! Use light skintones – like E50. We lived in Germany when my kids were young. The ice cream truck served “spaghetti” ice. It was vanilla ice cream that came out of the machine in strings and then was topped with cherry sauce on it! 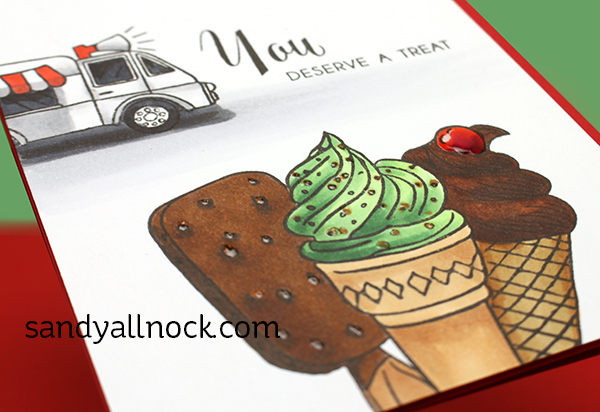 Hearing your chimes in the background added to the ice cream truck theme! Wonderful card…chocolate is good. I think you made everyone hungry with the voice over.